Not only is this Chicken with Strawberry Satay Sauce healthy and nutritious, but the flavor is out of this world delicious thanks to the sweetness of Florida strawberries. Since a traditional satay sauce is peanut butter based, I thought I’d do a play on a PB & J by adding seasonally plump and juicy strawberries from Florida Strawberry to the satay sauce. The result is a sweet and savory dipping sauce which pairs wonderfully well with grilled chicken. To say the kids will love this dish of Healthy Nutritious Chicken with Strawberry Satay Sauce is an understatement! After all, who wouldn’t love a dipping sauce that http://floridastrawberry.org/tastes like a peanut butter and strawberry jelly sandwich? I know you’re already aware of how sweet and delicious strawberries from Florida Strawberry are, but did you also know that only eight medium Florida strawberries contain more vitamin C than an orange? But wait, there’s more! Here’s an interesting fact that you may not have known; Because Florida strawberries are an excellent source of folic acid, they help the body metabolize protein and produce the energy our bodies require to be active and strong. Florida strawberries are virtually fat-free, and low in calories. A single serving of strawberries (one cup = 5 ounces) is approximately only 45 calories and within that serving is a high amount of ellagic acid which is believed to help reduce the risk of cancer! Plant City, Florida is recognized worldwide as the winter strawberry capital of the world, and it dominates the production of winter strawberries. Overall, the sunshine state of Florida produces over 8,000 acres of strawberries grown and is the second largest producing region in the United States. I don’t know about you, but the more I learn about the health and nutrition benefits of strawberries from Florida Strawberry are, the more I crave them in my diet! 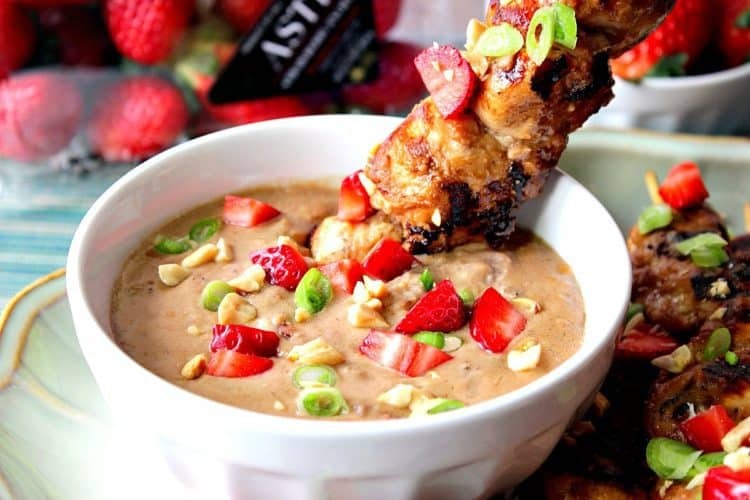 The peak season for purchasing Florida strawberries is December through April, so I suggest you head out to the market now to purchase Florida’s (don’t forget to check the label) finest strawberries so that you can make this recipe of Chicken with Strawberry Satay Sauce tonight. Your family (and their bodies) will thank you! The ingredients you’ll need to make this Healthy Nutritious Chicken with Strawberry Satay Sauce are: chicken tenders, Florida strawberries, grapeseed oil (or other light colored oil), garlic, coconut milk (I used light), lime juice, honey, peanut butter (I used natural), chili flakes, soy sauce (I used low sodium), salt, and pepper. For the garnish I used, Florida strawberries, scallions, and chopped peanuts. (Please find the actual measurements listed in the printable recipe card below). If you’re ready to make the strawberry satay sauce, let’s begin. *Note -You can make this sauce up to three days in advance if needed. Once made, cover and refrigerate the strawberry satay sauce until ready to use. Cut the strawberries into ¼” slices and add them to a medium saucepan. Stir in the fresh lime juice, oil, coconut milk, soy sauce, chili flakes, peanut butter and honey. Simmer the mixture on the stovetop over medium-low heat for approximately 20 minutes. Use a potato masher to gently mash the larger pieces of strawberry into smaller bits, if desired. Personally, I like my sauce with a nice bit of texture. Cool the sauce, cover and refrigerate if making in advance. To make the chicken tender skewers, soak wooden skewers in water for at least 30 minutes. Carefully thread the tenders onto the soaked skewers (two tenders per skewer). Brush the chicken tenders with light colored oil, soy sauce and season with salt and pepper. Place the skewers on a grill pan and cook over medium-high heat until caramelized grill marks form. Turn the skewers to cook the same way on the second side. Reserve 1 cup of the strawberry satay sauce in a separate bowl and use it to brush onto the partially cooked chicken tenders. *Note – Do not double dip the brush into the original jar of strawberry satay sauce since you’re brushing it on chicken that isn’t fully cooked. Cover the chicken and continue cooking until the tenders are no longer pink in the center (approximately 12-15 minutes). I made mine in a few different batches due to the size of my grill pan. If cooking them outside on a grill (or you have an extra large grill pan, add them all at once and cover to cook thoroughly after the strawberry satay sauce has been added. To serve, garnish with additional chopped strawberries, scallions, chopped peanuts, and the remaining strawberry satay sauce for dipping. Not only is this Chicken with Strawberry Satay Sauce healthy and nutritious, but the flavor is also out of this world delicious thanks to the sweetness of Florida strawberries. Place all the ingredients in a medium saucepan and stir well. Bring the sauce to a simmer and cook on low for 10 - 15 minutes. Mash the cooked strawberries into the sauce using a potato masher leaving as much texture as you like. This sauce can be made in advance and refrigerated up to 3 days if needed. Thread 2 chicken tenders on each wooden skewer which has been soaked in water. Brush each chicken skewer liberally with oil, and soy sauce. Cook the chicken skewers on a grill pan (or an outdoor grill) over medium/high heat until grill marks appear (approximately 3 minutes per side). Spoon approximately ½ cup of the strawberry satay sauce into a small bowl and use it for brushing on the chicken. Brush each chicken skewer liberally with the strawberry satay sauce and continue to grill for an additional 2-3 minutes. Cover the grill pan with foil, or lower the lid on the grill, and cook until the chicken is no longer pink in the center. *Note - if using an indoor grill pan, you'll most likely need to cook the chicken in batches. Keep the chicken skewers warm in the oven while grilling the remaining skewers. 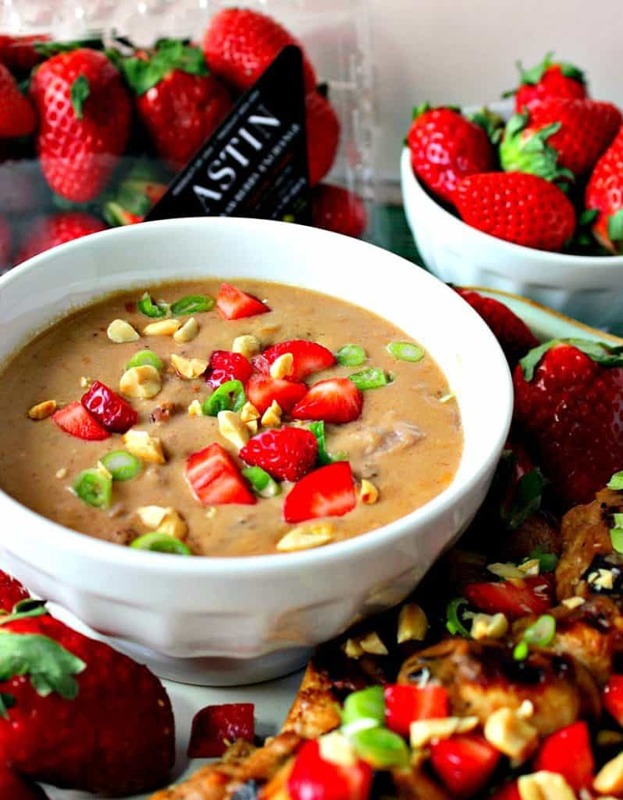 Place the chicken on a serving platter along with the remaining strawberry satay sauce for dipping and garnish the chopped strawberries, peanuts, and scallions. As you can see the healthy and nutritious Florida strawberry is an item you simply must add to your grocery cart the next time you go to the market. From sweet to savory recipes, and everything in between, strawberries from Florida are a treat that can’t be beat. To learn more, please visit the Florida Strawberry Website and also like and follow Florida Strawberry on FACEBOOK, INSTAGRAM, PINTEREST, TWITTER, and YOUTUBE. I hope you’ve enjoyed this recipe for Chicken with Strawberry Satay Sauce as much as I’ve enjoyed bringing it to you. For additional recipes featuring the little powerhouse known as the Florida strawberry, please click on the #SundaySupperlinks below, and also don’t forget to visit and pin the recipes on the #SundaySupper Pinterest board you can find HERE. The Sunday Supper Movement is committed to bringing our readers delicious recipes that encourage them to gather and eat together around the family table. Search for your favorite ingredients on our Sunday Supper website. Also, check out the Sunday Supper Pinterest boards for plenty more ideas and inspiration. If you should have any questions regarding this recipe for Chicken with Strawberry Satay Sauce, or anything else you see on my site, please don’t hesitate to contact me directly, or leave me a comment in the comment section below. It is always my distinct pleasure to get back to you with a reply just as soon as I possibly can! I’m digging that sauce! And the perfectly grilled chicken. Looks like a perfect dinner or appetizer! I agree. When I made it I served it for dinner, but next time I’m going to serve it as an appetizer. Renee this is just AMAZING! I cannot wait to try this! Thank you so much!! I know you’ll love it! Adding strawberries to satay really kicks this up a notch! I love the step by step you made it so easy to follow! Thank you, Cindy. 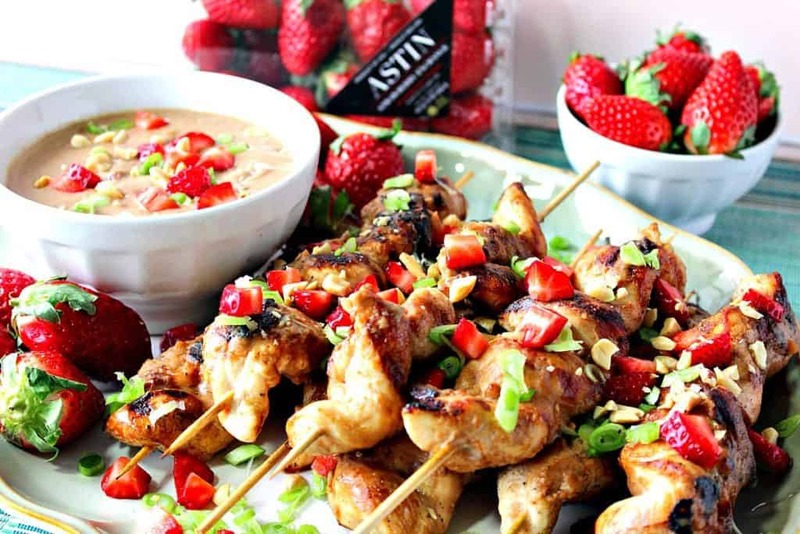 The strawberries add a really great twist to the satay! This looks beautiful and I can’t wait to try that sauce recipe! I am super excited to try this, plus it looks easy to put together! It is super easy, Candace! I do hope you try it. It is quite a feast for the eyes. Glad you think so. Thanks. 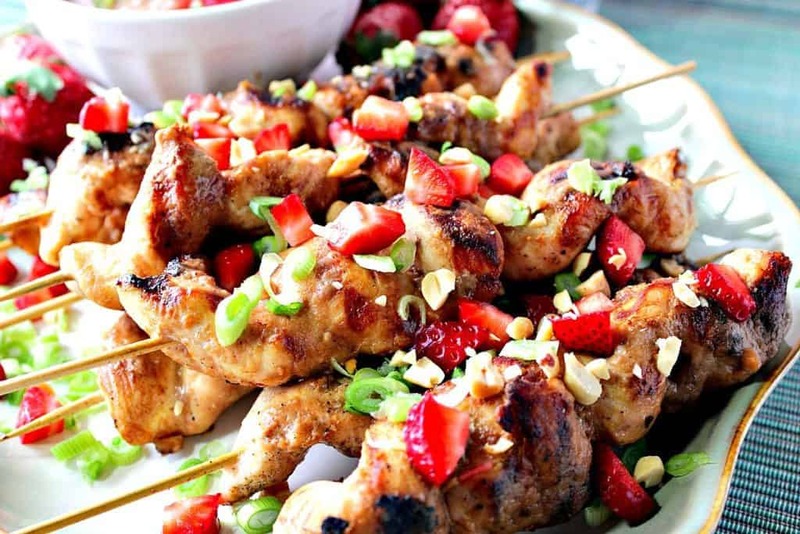 I love chicken satay anyway, and adding strawberries in the sauce is such a fun idea! Thank you. Glad you like it. It’s very tasty indeed! Its been a little chilly here to grill but I need to make some of this chicken satay when we get a warmer day. Love how you garnished the sauce with strawberries too! I love your twist on a classic dish. The Florida strawberries really take this up MANY notches! This dish is SO ready for a party! It sounds (and looks) amazing!!!! Party on! 🙂 Thank you!